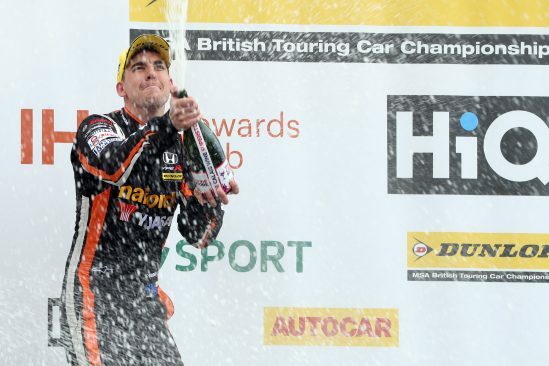 Halfords Yuasa Racing driver Dan Cammish took just four races to make the leap from Dunlop MSA British Touring Car Championship rookie to podium-finisher and potential title contender, as the Yorkshireman produced a standout performance at Donington Park this weekend (28/29 April). Fastest out-of-the blocks in free practice, Cammish mastered changeable weather in qualifying to place his Honda Civic Type R (FK8) fourth on the starting grid amongst the 32 high-calibre contenders for race one. 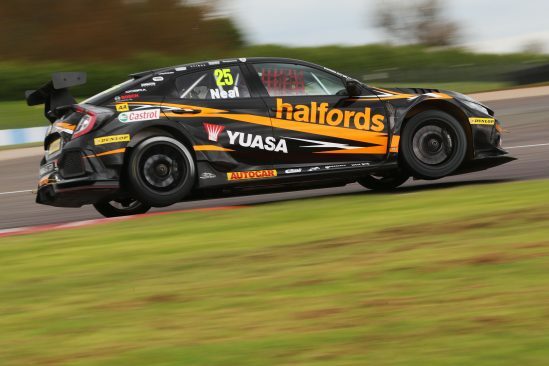 After gaining a spot at lights-out, the Halfords Yuasa Racing new boy then stole second at the end of the opening lap with a neat dive up the inside into the chicane. It was a position he would retain to the chequered flag. The two-time Porsche Carrera Cup GB Champion subsequently defied 66kg of success ballast and the less favourable hard-compound tyres in race two to lead until mid-distance. Although ultimately and ineluctably forced to concede ground as lighter rivals closed onto his tail, he clung on as well as he could and fended off late pressure to cross the finish line fourth. 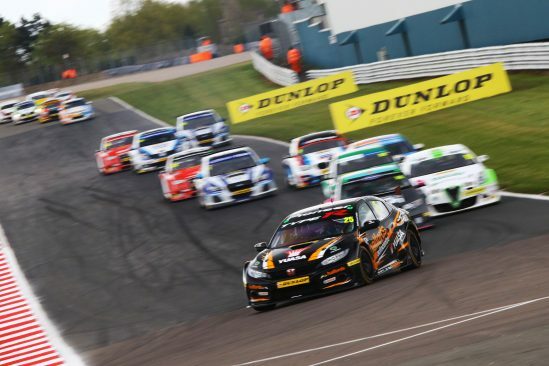 Cammish looked to be on-course to make it a hat-trick of top five finishes in race three when contact heading down the Craner Curves as he duelled for fourth broke his wheel rim. The 29-year-old’s strong results from earlier in the day have nonetheless vaulted him up the championship order from 16th into seventh, while maintaining his advantage in the Jack Sears Trophy standings. 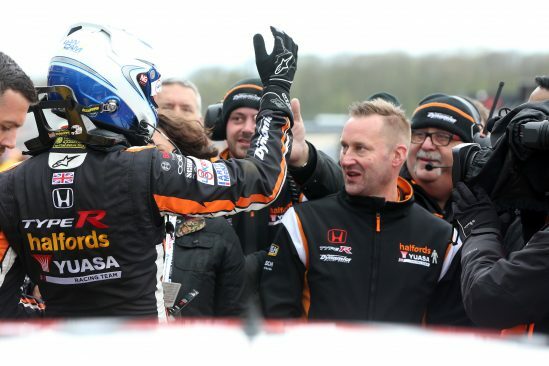 Competing at his home circuit, team-mate Matt Neal’s weekend was conditioned by qualifying, with the three-time BTCC Champion unable to better 17th on the grid in a topsy-turvy session. Undeterred, like Cammish, he showcased the pace and prowess of the new Civic Type R to scythe through to sixth in the opener. While race two was more of a struggle on the hard-compound rubber – yielding 16th place, just outside the points – the local hero bounced back in fine style in the finale to battle his way to seventh, in so doing gaining five spots in the title table. 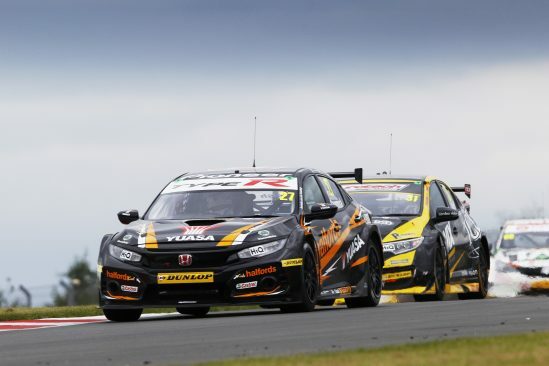 In similar fashion, Honda has almost halved its deficit to the top of the Manufacturers’ classification, with Halfords Yuasa Racing leapfrogging from 13th up to fourth in the Teams’ Championship ahead of the next outing at Thruxton in Hampshire on 19/20 May.